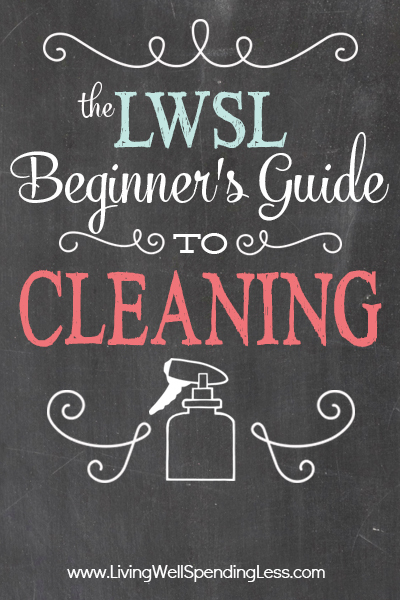 This is Part Four of an 8-Part Beginner’s Guide to Cleaning Series. See the overview here. Today we are going to tackle another room that gets daily use….and abuse. 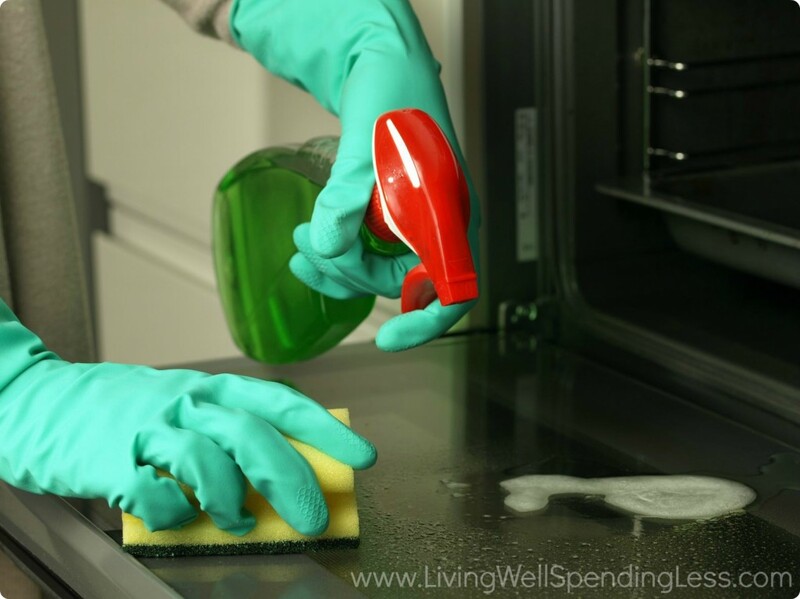 I don’t know about you but while I don’t always mind doing the dishes and wiping down the counters so that my kitchen looks clean, I absolutely dread the thought of deep cleaning. 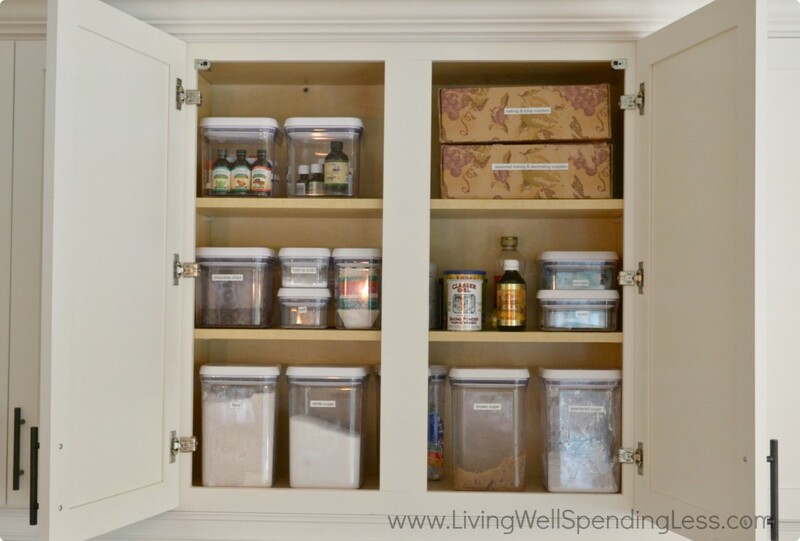 Sometimes I would just prefer that all those closed cabinets just stay closed. No one needs to look behind there anyway right? But a clean kitchen is not only a joy to look at, it is a joy to work in too. And considering just how much work we really do there—preparing 3 meals a day, 7 days a week, doesn’t it seem like a good use of time to make your kitchen space as clean & functional as possible? Kitchen counters, with all that flat surface space, can easily become collection zones for everything from school work to mail to shoes, keys, clothing, toys, and any number of items that have somehow lost their way. After clearing your surfaces, vow to make your kitchen a “clutter free zone” instead using the permanent collection zone you set up last week to gather the items that need to be put away. Once again I will walk you through the steps for cleaning the surfaces most commonly found in this zone, giving detailed instructions for how to clean each one. If you are a seasoned kitchen-scrubber, much of it may be review—feel free to skip to the end of the post, or add your own tips & tricks in the comments below! 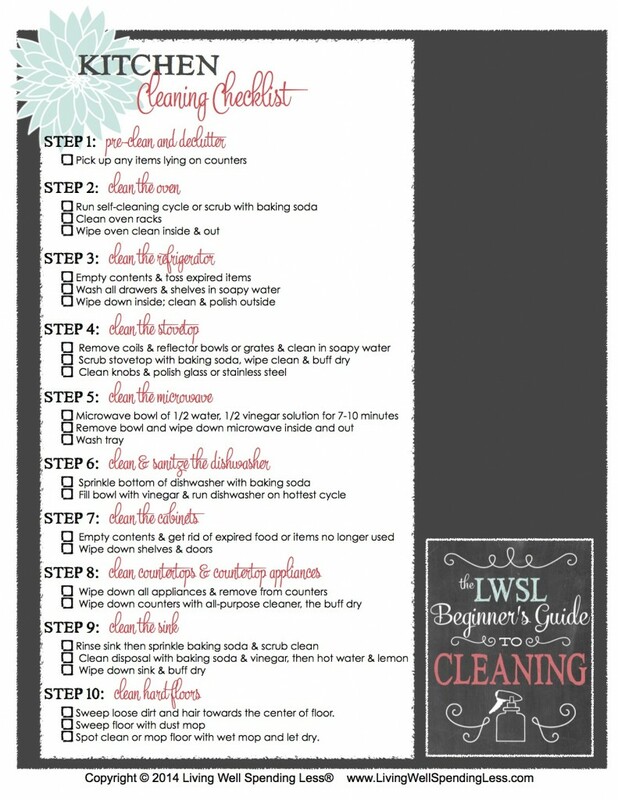 At the end of the post you will get a printable checklist to use as you tackle your kitchen. How-To: Pick up any items lying around the kichen, including any clutter that has collected on counters or the kitchen table, then wipe down surfaces to remove any sticky residue or crumbs. Place items in appropriate baskets for each family, or collect items in a single basket to be put away. (A great task for kids!) Hopefully after last week’s task you have already created a permanent collection zone in your home, but if you haven’t, be sure to do so now—either at the front entrance, near the stairs, or in a corner of the kitchen or living room. 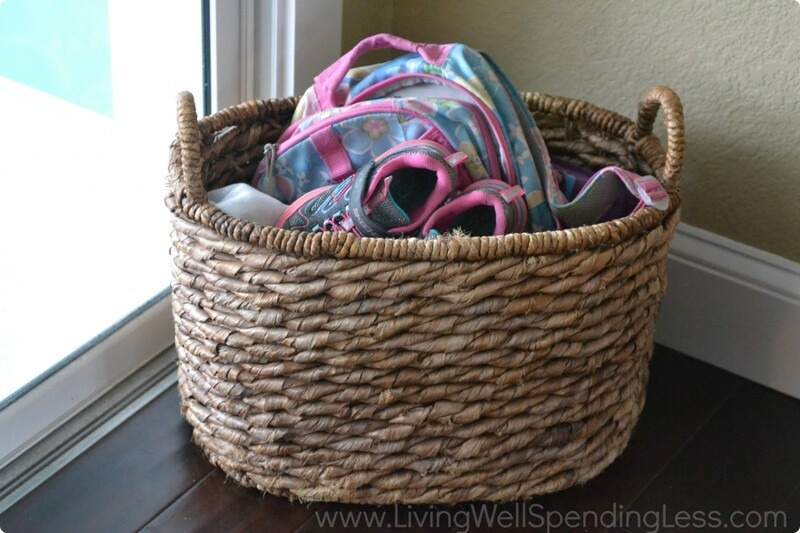 Use your basket or baskets to collect any items that would normally get left lying around. How-To: a.) Self Cleaning Oven: Remove oven racks & soak in soapy water solution, then scrub clean and let dry. Open windows to air out kitchen while oven is cleaning. Turn on self-cleaning mode on oven. Be sure the door locks! This cycle will take anywhere from 2-6 hours. When oven has cooled completely and door unlocks, wipe out any ashes & wipe down oven with wet rag. Return racks to oven. b.) 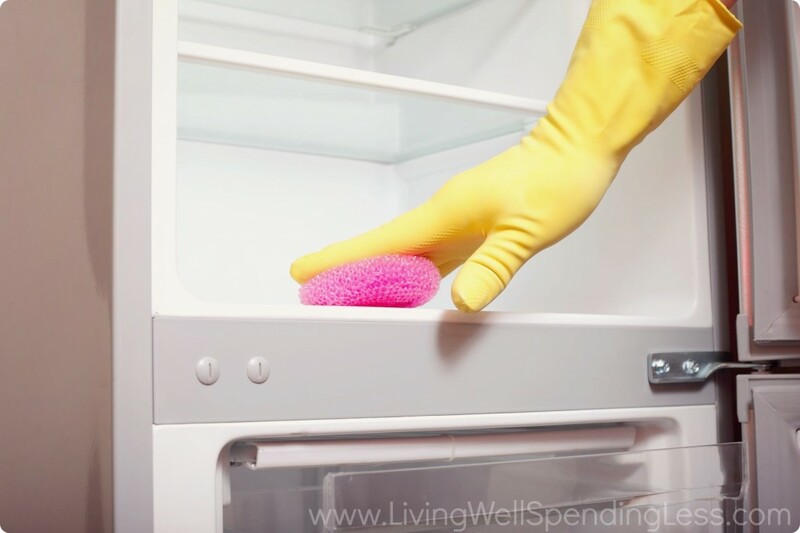 Non Self-Cleaning Oven: Remove oven racks & soak in soapy water solution, then scrub clean & let dry. Mix ½ cup baking soda with 3cups warm water, then liberally spray solution on sides, top & bottom of oven. Let set for 1-2 hours, then check to see if charred areas have loosened. If not, reapply spray and let set longer. Chip away charred areas with chipper or spatula, then spray with ½ water/ ½ vinegar solution. Wipe clean with wet rags. How-To: Fill sink with hot soapy water. Empty contents of refrigerator & freezer. Use cooler for frozen items. Toss any items that have expired, smell bad, or don’t look quite right. Remove all drawers, shelves, and ice trays and wash in soapy water solution. Spray inner sides, doors, top and bottom of refrigerator with all-purpose cleaner, then wipe down with wet rag. Replace shelves & drawers. Return food to refrigerator & freezer. Wipe down outer front, top, and sides of refrigerator with rag, then polish stainless steel if necessary by rubbing with polish then buffing clean with a dry rag. Supplies needed: dish soap, all purpose cleaner, baking soda, sponge or rags, stainless steel polish or glass cleaner. How-To: a.) Electric Stovetop: Remove heating coils and reflector bowls from stove. Soak bowls in hot soapy water to loosen and remove caked on gunk and scrub coils clean with hot soapy water. Wipe down stovetop with wet rag, then sprinkle with baking soda. Scrub well with sponge or rag. Towel dry. Lift stovetop and clean underneath. Return reflector bowls and heating coils. Wipe down knobs. Polish any stainless steel, if necessary. b.) 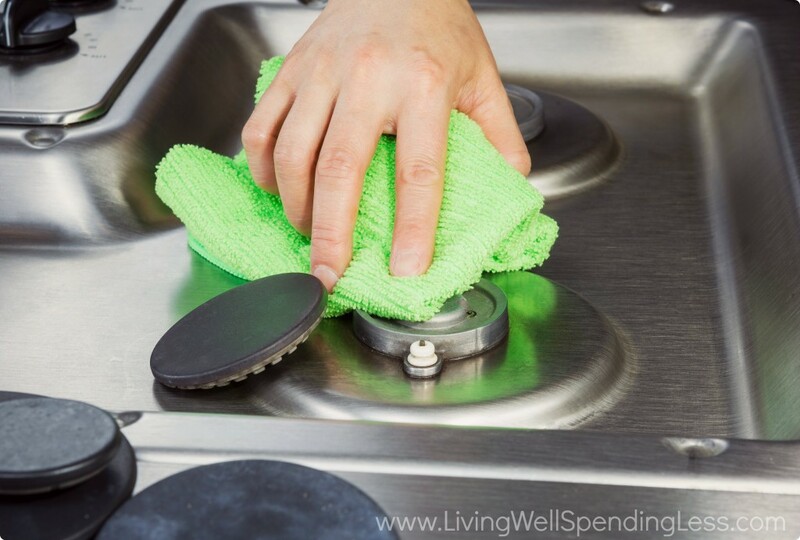 Gas Stovetop: Remove heating grates and soak in hot soapy water to loosen and remove caked on gunk and scrub clean with hot soapy water. Wipe down stovetop with wet rag, then sprinkle with baking soda. Scrub well with sponge or rag. Towel dry. Wipe down knobs. Polish any stainless steel, if necessary. c.) Glass Stovetop: Wipe down stovetop with wet rag, then sprinkle with baking soda. Scrub well with non-abrasive sponge or rag, using plastic scraper to remove any caked on gunk. Towel dry. Spray with glass or counter cleaner and buff until shiny. Wipe down knobs. Polish any stainless steel, if necessary. Supplies needed: water, vinegar, bowl, sponge or rag, dish soap, glass cleaner, stainless steel polish. How-To: Fill bowl with ½ water, ½ vinegar solution. Microwave on high for 7-10 minutes, allowing water to boil for several minutes so that steam forms and softens any debris or residue. Remove bowl and try; wipe sides, bottom, and top of microwave clean with wet sponge or rag. Wash tray in soapy water solution. Wipe down front of microwave with glass cleaner & polish stainless steel, if necessary. How-To: Remove bottom rack & check drain to make sure there are no blockages or loose pieces. Sprinkle bottom of dishwasher with baking soda, then return lower rack. 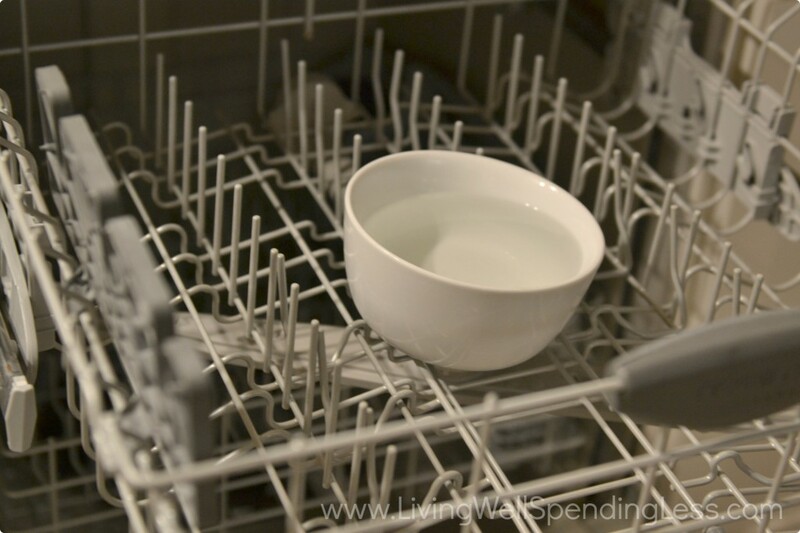 Fill a cup or bowl with vinegar and place on top rack of empty dishwasher. Run dishwasher on the hottest water cycle. The combination of the vinegar and water will clean, sanitize, and brighten your entire dishwasher. Wipe down front of dishwasher & polish stainless steel, if necessary. How-To: To keep from being totally overwhelmed, only clean out one cabinet at a time. Start by emptying cabinet of all contents. Toss any food items that are expired or no longer look/smell/taste edible. If cleaning a non-food cabinet, remove any appliances, dishes, or tools that are broken or that you no longer use & either toss them or fill a box for donation. Once cabinets are empty, wipe down all shelves with all purpose cleaner and wet rag, followed by a dry rag. Return items to cabinet. Wipe down door fronts with wet rag or Magic Eraser to remove fingerprints and dirt. 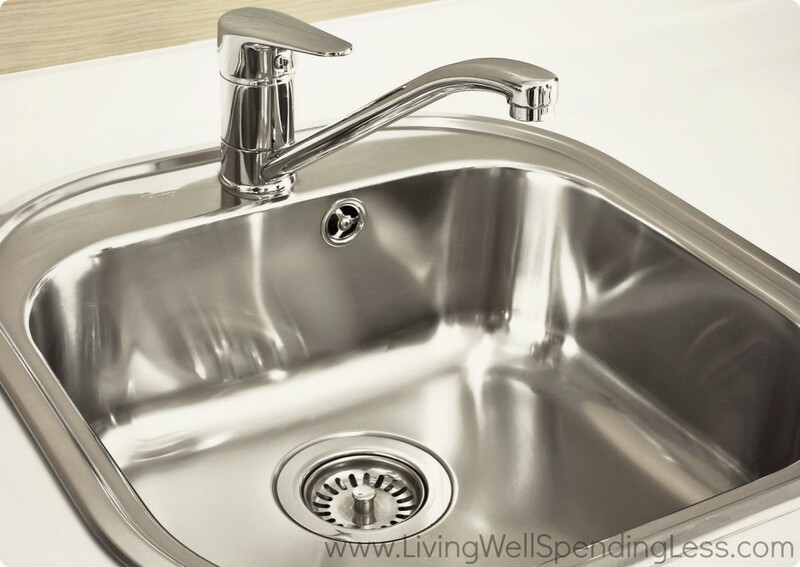 How-To: Clear sink and rinse clean with water. Sprinkle baking soda liberally over wet surface of sink and use sponge or wet rag to scrub sides and bottom of sink, as well as faucet and caulk seal around rim of sink (if necessary). Let sit for a few minutes. Pour ½ cup baking soda down garbage disposal, followed by 1 cup of vinegar. Boil 4 cups of water, then pour water down disposal to rinse baking soda and vinegar. Cut lemon in half and place in disposal, then run disposal until lemons have been crushed and washed away. Rinse sink and faucet thoroughly, then buff dry with an old towel. How-To: Before beginning, move as much furniture from the floor as possible. Starting at one end of the room, carefully sweep loose dirt and hair towards the center of floor. Methodically make your way around the room, sweeping all dirt towards the center into one pile. Sweep into dustpan and throw away. Next, do a sweep of the floor with your dust mop to remove any remaining dust or hair. 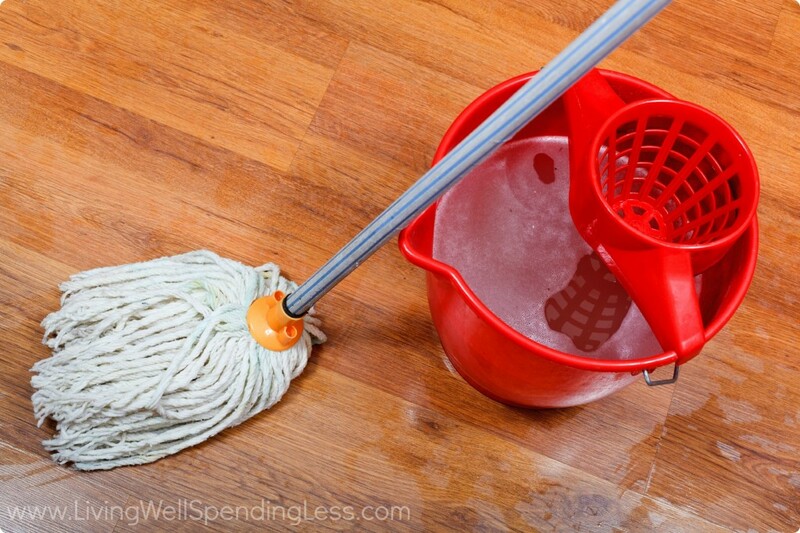 Spot clean any sticky or dirty spots, or mop entire floor with wet mop and let dry. Set aside a good chunk of time—again at least 2-4 hours—sometime this week to work on deep cleaning your kitchen. Clear the clutter in your kitchen and declare a clutter free zone. 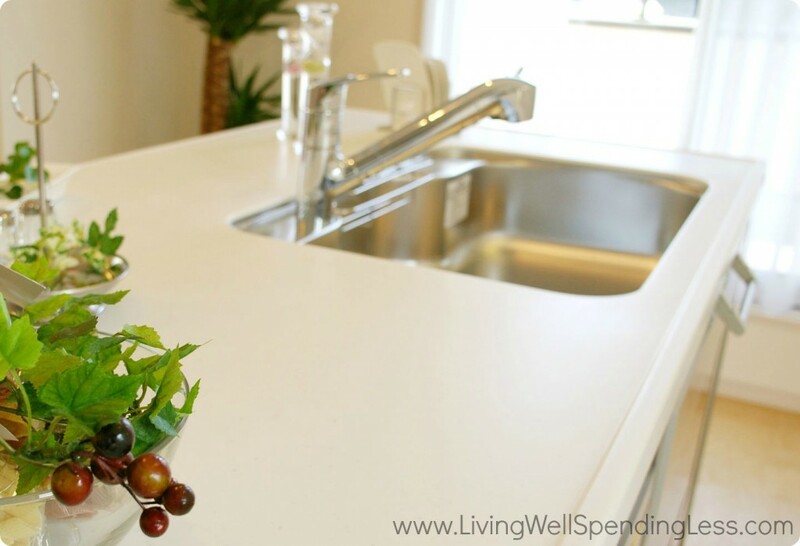 Make it a goal to keep nothing on your counters except the kitchen appliances you use on a regular basis. Work on training your family to use the “collection zone” you set up last week. 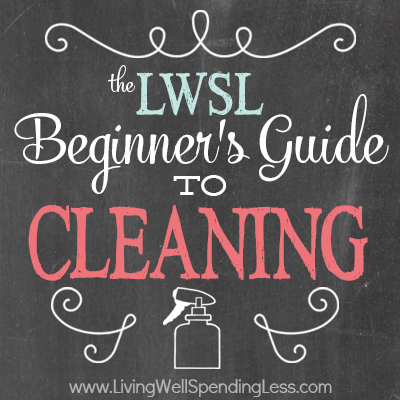 Follow the Living Space Cleaning Checklist to get your living area shining from top to bottom. If possible, open up the windows to let in some fresh air as well! Did I miss anything? What are your biggest challenges to keeping your kitchen clean? This is great! Thanks Ruth! Working your way top to bottom makes cleaning go smoother too. 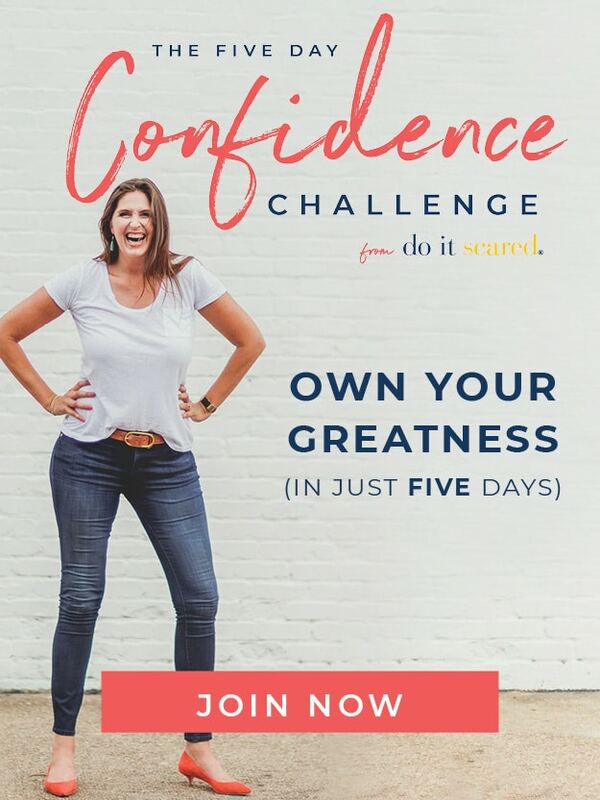 I really get inspired by your website. I am loving the series!! The most challenging part of my kitchen to clean is my floors… They are some form of dyed cement tiles and they are very porous. I live on a US military base in Puerto Rico and the floor are the original ones that were installed in 1941, 73 years old!! The areas where there has not been much traffic is nice and shiny and smooth but the traffic areas are a bear. I have relented to scrubbing 3 foot sections at a time with a stiff scrub brush and bleach. Any suggestions would be greatly appreciated!! You forgot 1 thing in the refrigerator step. Vacuum the coils. Doing this 1-2 times a year means it doesn’t work as hard to keep things cold and therefore saves money. I definitely recommend doing this while the fridge is empty in case the coils are in the back! Your suggestions on the dishwasher and ovens work very well. I coach people on this many times, if you have a hard water problem, you can use a small cup as a reservoir and fill it with vinegar with every wash. Don’t just pour vinegar in the bottom of the dishwasher, because the first thing most models do when it is started is drain, so you would be wasting the vinegar. But by using a small cup as stated above and leave it open face up, with every wash, you are cutting hard water deposits on the interior of the machine, the pumps, and also on your dishes. I’ve had some very good feedback from people regarding this so I know it works. I made the mistake of cleaning my fridge interior with a commercial cleaner once. Smelled nice, but not so nice when the food tasted of the cleaner. Baking soda is a much better choice. Not only cleans well, but deodorizes too. An should your fridge happen to have milk spilt in it, (Or in your car, on an upholstered chair, etc) fresh coffee grounds, as in out of the can, not used, will get rid of the smell. Worked on the seat of my pickup when I dumped an open quart container on it. Learned this from a friend who grew up with the family dairy operating. Thank you so much for this post! 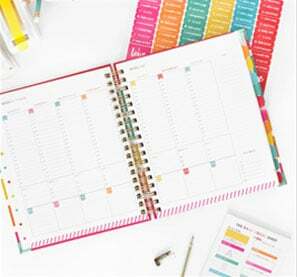 I confess that I am not very organized and I find it hard to find time for cleaning so this article helps me a lot! Thanks! Stockwell Carpet Cleaners Ltd. Thank you, Ruth! Thank you for existing and for helping me in such an amazing way. Your post is exactly what I needed. I struggle finding the time to scrub my way to a clean kitchen. Finding your ARTicle is the best thing that happened to me today. Thank you Ruth, I have been struggling on how to deep clean a kitchen. But I forgot to do my cabinets but I got everything done yeah me.